« How deep can you dive on SCUBA? What’s involved in SCUBA training? This is a another common question along with: How do you learn to dive? How long does it take? There are several Internationally recognized SCUBA training agencies. There are some differences in the classes, but they all have a similar elements. Classroom: Learning ranges from books, to multimedia, to Internet training, but each contains a degree of classroom participation. Here an instructor can answer any questions, and emphasize safety points. Often they will stress procedures that me more common in the local diving area. Yes, there is a test. Pool: The first dive experience is in “confined water”, usually a pool. Here we learn to perform certain skills in a safe, controlled environment. Once mastered we move on to Open Water. Open Water: This is usually a lake or quarry. Here we practice the skills again, and get to swim around and enjoy the dives. The final dives may be on a boat, depending on the local diving. I like to think of the class as covering two general areas: First, how to plan and execute your dive, and second, how to safely handle any problems that may occur during a dive. 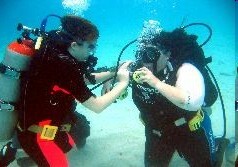 The Basic SCUBA class roughly takes 14 hours of classroom, 10 hours of pool, and 5 open water dives. Once completed, it’s recommended that new divers stay shallow (less than 60 ft) until they feel comfortable with the skills they have learned. Then they can take additional training to learn the skills necessary to go deeper. This entry was posted on Wednesday, January 14th, 2009 at 2:18 pm	and is filed under Basic SCUBA. You can follow any responses to this entry through the RSS 2.0 feed. You can leave a response, or trackback from your own site.